The LGBT community has been making great strides in the world and equality, but there are still some underlying issues. People are still misrepresenting the LGBT community due to harsh stereotypes. “Issues ensue when the almost-always dominating heterosexual society marginalizes the homosexuals. It has been a long-standing matter of discussion that homosexuals are discriminated for their way of living, and this could be traced down to the roots of particular stereotypes perpetuating in our hetero-centric society.” (Tagundina) In “The Coast is Queer”, Iman Tagudina covers the issue of media portrayal of the LGBT community. On broader scale, she brings up good points about how the LGBT community is acridly seen by society. 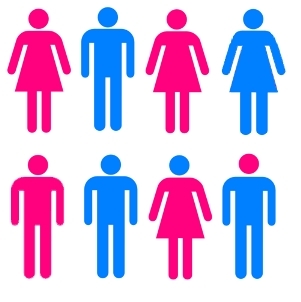 She begins the piece with the question, “How about we call a man wearing pink “gay”?” This common association with homosexuality eventually builds into a string of stereotypes and slurs. Why is it that we do this? There is some underlying issue we aren’t really looking at, because it is engrained and comfortable in our society. Stereotypes have been around for decades. Not just in the LGBT community. Recently, I watched a video of East Asians reacting to Yellowface ( someone who is not Asian, dramatically or comically, portraying themselves as one, usually in films.) The people reacting to the imitations of their culture were disgusted and disheartened. The same thing happens to the LGBT community. The media/Hollywood “dramatically” portray cultures and identity, which are sadly taken as blatant truth by society. I found a list including some of the worst representations of the LGBT community within films. You can look further into this at flavorwire.com. In this article you find examples of the LGBT community being portrayed in various dramatized ways. Oftentimes, the community becomes a cliche. “Gay best friend” or “sexual fiends” take the wheel over and over again when it comes to representing the community. Constantly marginalized, no one really ever seems to have a problem assuming all gay people are like that. Why? Because things like the media and just general assumptions lead society to think it is the “okay thing” to do. When it isn’t. Blocking an entire population of people into a small and demeaning space is never okay, but somehow this problem has become invisible due to society’s chronic use of stereotypes. In essence, we are all just humans. How has it become different than that? “That” being: why are we allowed to determine what kind of “thing” someone is, when in reality, we are all on the same boat. Harvey Milk once said ,”All over the country, they’re reading about me, and the story doesn’t center on me being gay. It’s just about a gay person who is doing his job.” That is my main view here. This man was the first openly gay person to be elected in an office. A gay, trans, lesbian, whatever it is you prefer, should be looked at for their qualities and ethics. Sexuality should play a small part in what you are as a person. What is it that you are good at ? What do you want to be known for? Many people want it to be about their successes and accomplishments in life. Why can’t it be the same for gay people? The 20 Worst Depictions of LGBT Characters on Film. (2013, June 26). Retrieved July 31, 2015. Basic Definition: Yellowface. (2012, November 5). Retrieved July 31, 2015. East Asians React To Yellowface. (n.d.). Retrieved July 31, 2015. Tagudina, I. (n.d.). “The Coast is Queer”: Media Representations of the LGBT Community and Stereotypes’ Homophobic Reinforcement. Retrieved July 31, 2015.